As you probably know already, WordPress has a core set of functionality and features, as well as thousands of plug-ins you can install. 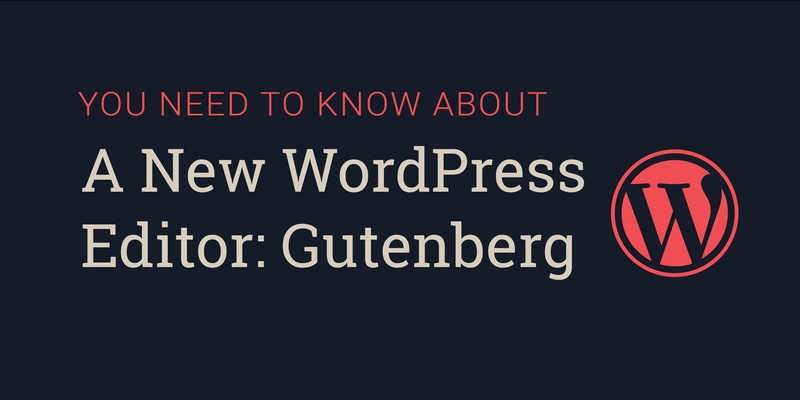 One plug-in in particular called Gutenberg is soon going to be part of WordPress core and will be included in version 5.0 of WordPress. This plug-in allows you to use what are called 'Blocks' to embed feature rich content into a page and organize is how you see fit. Examples of feature rich content include photo galleries, columns, lists, paragraphs and more. Historically, many developers and WordPress users leverage plug-ins or custom code to customize a page. The hope is that Gutenberg will simplify the page building process. See below for a quick view of how the editor will appear. By having a consistent set of Blocks at your disposal, the user experience across WordPress sites may become more consistent and user friendly on both the front and back end. More and more of our clients are asking for drag and drop, page builder functionality within the admin, Gutenberg is a step in that direction. Of course with any new, big WordPress release, there will likely be a learning curve and bugs along the way. There has been a lot of debate among the WordPress community on whether or not this is the right move for WordPress core, but only time will tell. The ArcStone team will keep you up to date on how this roll-out might affect your current or future WordPress projects. You may see a large banner within your WordPress admin asking you to try out Gutenberg. We recommend at least waiting until WordPress 5.0 is released, which may not be for a few months. If you have questions in the meantime, don't hesitate to reach out.